This is the vignette that sits on top of our entertainment center. I usually take down some the 'everyday' decorations but I also leave some of them up. The globe is always on the entertainment center. I love it! I just draped some black Halloween cloth over the top. The bottles are also usually up there every day. I did add some Halloween labels to them though. The labels are just stickers and patterned paper. I added the huge spider to our decorations this year. My little man was not a fan when I took this spider out of the box. He was terrified by it! We actually went through several possible homes for this spider before he came to live on my vintage gold mirror. Everywhere we moved the spider Austin said "he's still looking at me." When we put him on the mirror he was finally satisfied because the spider is looking at the entertainment system not at him. Needless to say he hates spiders. He's having a hard time with the whole Halloween season because there are spiders everywhere. Hopefully, he'll adjust and we'll be able to walk past the Halloween at Target again soon. Are your Halloween decorations up? 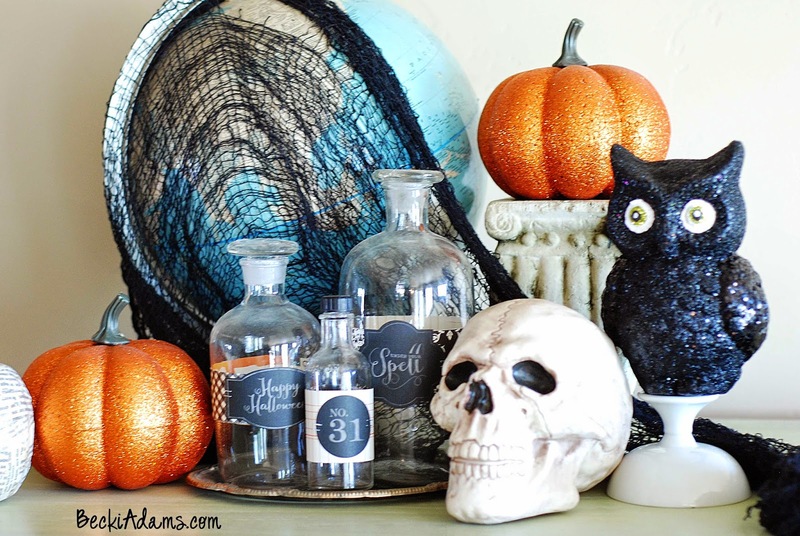 What is your favorite part of your decorations? 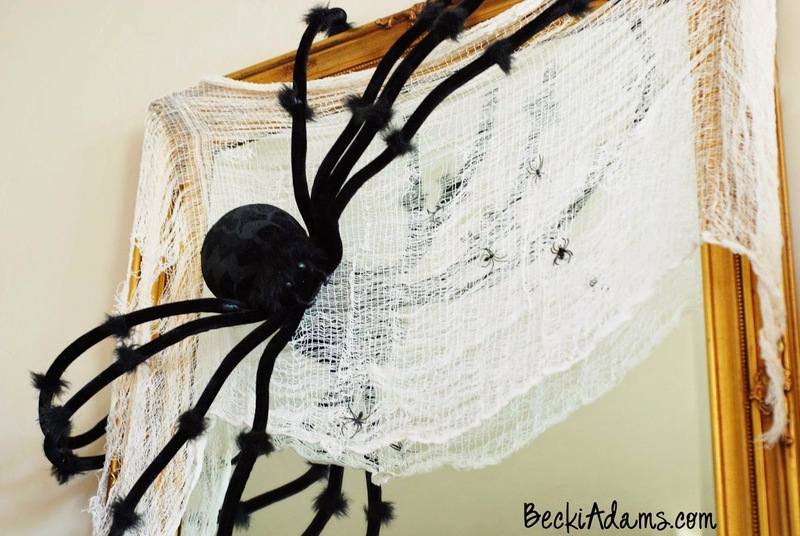 Your decorations look so awesome, Becki! 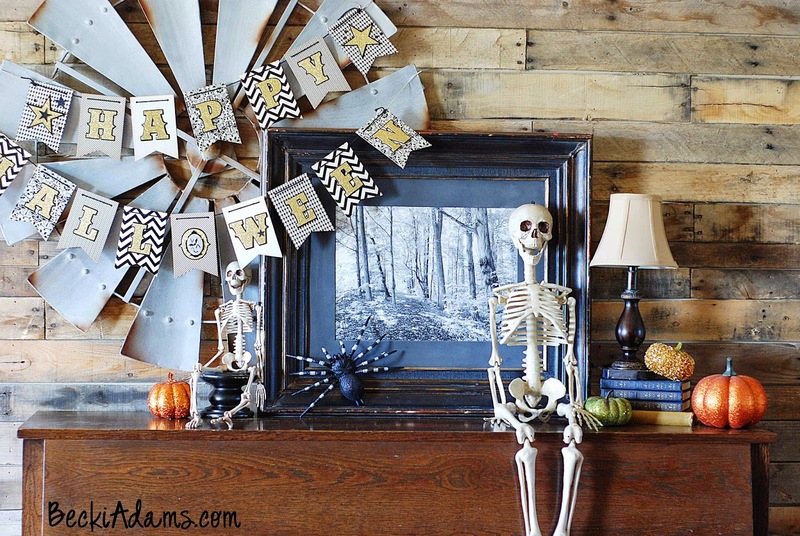 I especially love te skeleton on the mantel.